Most people who prefer using high quality sportswear during their various winter outdoors activities will first consider either Columbia or North Face, two very popular brands that make a wide range of high quality apparel for various outdoors activities. As both companies offer a wide selection of quality jackets, coats and parkas, it can be quite difficult to choose between the two brands and the various types of apparel they make, specially when some are quite similar in look and features. ​To help select the most appropriate brand that fits your taste and needs, this article will try to point out some of the differentiating points between the two brands and present you with our selection of the most popular Columbia and North Face women's jackets and parkas bought by Amazon customers. Columbia was established in 1938, as a hat distributor out of Portland, Oregon and ended up growing into a multi-million-dollar outerwear giant. On the other hand, North Face was first founded in 1968 in San Francisco as an equipment retail store for outdoors fans and grew up to become today one of the largest and most respected names in outwear. In general, if you are looking for authentic sporting wear and not just for something to keep you warm and comfortable, you might want to consider North Face. But if you are just looking for a high-quality winter coat that will keep you warm and comfy, then do not hesitate to go for a Columbia. If you have budgeting constraints and still want to get a quality winter coat, you might want to consider a Columbia, as North Face products are in general more expensive. It does not really make sense to pay the higher price tag of a North Face, if you will be using your coat to simply go back and forth to work or do your shopping. But if you will be using it for any sort of winter sports, it is well advised to get a North Face. If wearing products whose brand names have become a status symbol is something you like, then go for a North Face, as it is more of a status symbol than Columbia, though both brand names have by now become a status symbol. Many Columbia jackets and coats are built with the proprietary Omni-Shield™ advanced water and stain repellency feature. They also have the proprietary Omni-Heat™ synthetic thermal reflective lining and insulation to keep you warm when it gets real cold. Other Columbia jackets and coats come with TurboDown™ insulation which is a sort of performance enhanced down that fuses with the Omni-Heat™ synthetic insulation for lightweight warmth and heat retention. Most North Face jackets and coats have high-fill power goose down ranging from 550 to 900 fill, the highest quality commercially available. The insulation provided by this traps hot air for reduced heat loss and increased warmth. In addition, many North Face jackets and coats are built with DWR (Durable Water Repellent) which is applied to the face of the fabric to provide the first line of defense against wet weather. Other North Face jackets and coats come with the proprietary PrimaLoft® feature that offers the lightweight loft, warmth and compressibility of down with the wet-weather insulating performance of synthetics. Most of Columba and North Face jackets are machine washable. But washing instructions should be carefully followed as some are only washable on cold, without fabric softener, and require to be tumbled dry on low. North Face products come with ​a Life Time Warranty, while Columbia has a 60-day return policy. 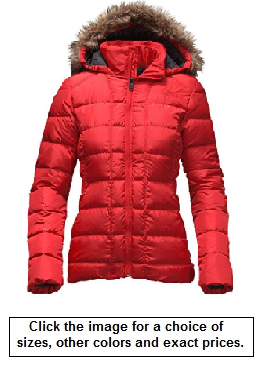 ​You will find below some of the most popular Columbia and North Face winter jackets and coats bought by Amazon customers. At the time of writing this article, each of these selected jackets and coats had received an average rating of at least 4.5 stars (out of 5 stars) from Amazon customers who have provided mostly excellent reviews. Therefore, we feel that you will probably be quite happy with any of these selections. 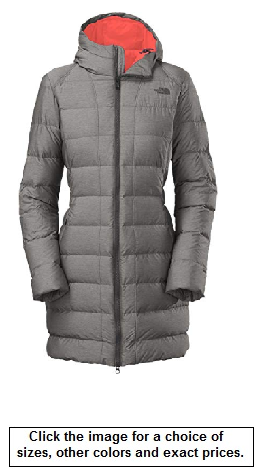 If you don't find a coat that you like among those presented below, you can click further down special links that will provide you with ALL the Columbia and North Face jackets and coats for women and men available on Amazon. ​When you click any of the Amazon link images below you will be provided with the exact price of the product and with a choice of colors. You will also have to specify your size. Note that Amazon prices often includes a generous discount to the list price. If a discount exists, both the Amazon price and the list price will be displayed when you click the Amazon product link images below. ​Finally, you should select the brand that offers the colors and styles that fit best your body type and that you will enjoy to wear. Shell: ​Omni-Shield™ 100% poyester water and stain replellent shell with Omni-Heat™ ​ 100% thermal reflective polyester lining. Insulation: Omni-Heat™ ​ 50% thermal reflective polyester/50% recycled polyester. Length from center-back: 34 inches. Comfort cuffs and thumb holes. Machine washable on cold (follow instructions). Comes in various colors (color choice offered when you click the Amazon link image). Warranty: Returns are accepted within 60 days of purchase ​. Shell: 100% polyester with 100% polyester Omni-Heat™ reflective microtex light lining. Length from center-back: 27 inches. Plush interior. Attached adjustable storm hood. Interior security pocket. Zippered hand pockets. Shell: 100% nylon with 100% polyester Omni-Heat™ Thermal Reflective lining. Insulation: 80% 600 down fill and 20% feather. 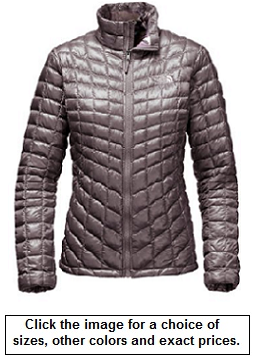 Quilted down jacket featuring removable/adjustable storm hood and standing collar. Drawcord adjustable waist. Comfort cuffs. Shell: 100% nylon Omni-Shield™ water and stain repellent with 100% polyester Omni-Heat™ reflective lining. Insulation: 650 TurboDown™ ​ insulation, 100% Polyester. 2-way centerfront zipper, zippered hand pockets. Drawcord adjustable hem, comfort cuffs. Shell: Quilted 100% polyester with DWR​ (Durable Water Repellent). Length from center-back: 26 inches. Zipper closure and internal media pocket with media loop. Concealed zip at inseam hand pockets. Removable, zip-off, faux-fur trim on hood. Encased elastic at waist side panels. Elasticized sleeve hem and ruched bottom hem. Shell: 100% nylon taffeta with 100% recycled polyester lining. 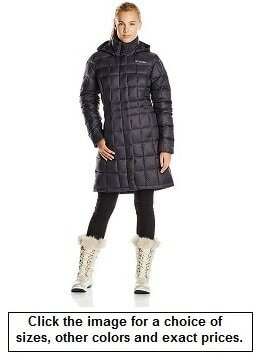 Mid-thigh length quilted jacket with elastic-shaped waist. ​Life Time Warranty / Machine Washable. Insulation: PrimaLoft® ThermoBall™ synthetic insulation. 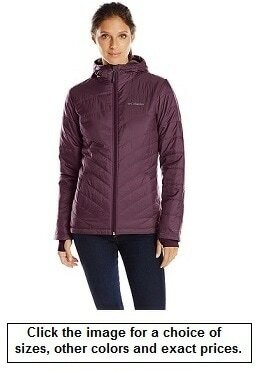 North Face's most versatile synthetic-insulated jacket. Stowable in pocket and hem cinch-cord. Shell: 100% polyester iridescent taffeta with 100% nylon satin twill lining. Length from center-back: 38 inches. Inseam zip hand pockets and internal media pocket with media loop. Metal logo rivet at left upper sleeve. Embroidered logo at left chest and upper right back. Life Time Warranty / Machine Washable.